For many people, Usability is the first thing that comes to their mind when they think of UX. In many product UX discussions people mention things like: “users need easier ways to do things”, “the number of clicks are important” and “my grandmother should be able to understand..”. At the end of the day many things contribute to the User Experience. This includes the products’ UI and Usability, but at the same time, even things like the users’ mood, the political situation in his country, branding and peer reviews factor in. In other words, a lot of what makes up the User Experience has little to do with how usable it is. It may seem counter-intuitive but sometimes just having everything working smoothly and as expected is not the key to keep your users active and engaged. People watch horror films, climb the Everest and listen to music full of distortion and dissonance. None of these conform to usability concepts such as “seamless”, “intuitive” and “easy to use”, and yet not many things can match the experience of reaching the peak of Mt. Everest. There is a lot of talk about friction being a bad thing for UX. Many usability experts promise to remove friction from the product experience. Even Apple has been promoting friction-less experiences in their payments and other products. While friction is a negative agent for usability, for user experience friction can have both good and bad effects on the user. Good friction comes from things that may challenge your users and make them need to think more while using your product, maybe even make them do extra steps. — But at the same time imprint a stronger user experience. A nice example for good friction is illustrated in this fantastic article on how good friction adds to the over-all users’ gaming experience. Another nice article explains how it’s important to balance the good (motivation) and the bad frictions (hurdles). The term Usability has been there for quite a long time, people like Donald Norman have popularised since the late 80s. The term User Experience emerged much later and is somewhat perceived as Usability’s successor. 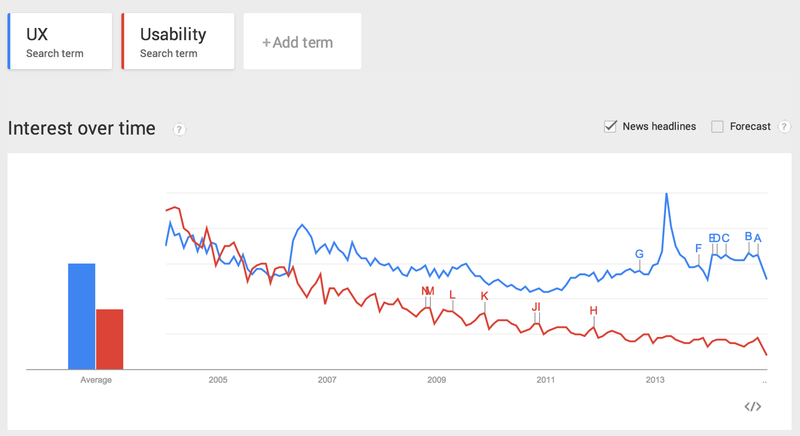 The following graph shows how “UX” has been stealing the limelight away from “Usability” in the recent years. For many people UX is synonymous to Usability. It may be good to note that UCD (User Centered Design) is also sometimes mixed up with both of them. And I can imagine new terms and term permutations may pop up in the future, making things even more confusing. While Usability is a very important factor in achieving a good user experience, you should not always compromise other important things for it.